Style Breakdown – Easy Breezy Fabrics! Lauren looking so easy breezy cool in loose fitting fabrics. Flowing fabrics are not limited to dresses and gowns. Take a note from Lauren’s look here. She paired a loose fitting boatneck blouse with slightly flared loose shorts. This is a great look for the office in the warm season. Not a fan of tights, not to worry, you can remove the tights and turn the heels in for some embellished ballet flats. Lauren chose not to wear accessories to keep this look minimal. Golden Globes – Red Carpet Standouts! Emma Stone wearing an open back Calvin Klein dress. I love the simplicity of this look. This is a great example on how to wear the ‘minimalist’ trend. The peach tone of this dress compliments her complexion so well. Eva Longoria wearing a Zac Posen number, showing some cleavage with a plunging neckline. This dress fits her body like a glove. The dress is dramatic, so it was a smart choice to keep everything else simple. She chose an updo, which is a contrast to the train of her dress, it’s a great compliment! Megan looking sultry as usual in this Armani Prive gown. The bandage overlay on top is my fave part on this gown. I find it adds a bit of edge to the bottom half of the dress. Her hair is curled perfectly to one side to give sight to the shoulder strap of the dress. Halle Berry is classic elegance with a bit of sass in this Nina Ricci piece. I must say she kept it safe with the black, which I love because she knows what works for her. It’s vey age appropriate on her. Lea Michele looking so lovely in this Oscar de la Renta gown. The colour is young, fun and fresh! I would have preferred to see her hair in a more sleek updo as her gown has the ruffled detailing already. But the dress is a great choice for her age. This is a great accent to a casual look. Pair it with denim, cut-off shorts, leggings etc. It works great over a tank or tee as well. Worried about wearing this in a warm climate, not to worry! I say wear what you want all year round. It’s a great contrast to what the current acceptable attire is for that season. These babies are similar to the Oxfords. This style will immidately prep up any look! I personally love the Barouges when it’s paired with trousers. Janelle Monae anyone! She is definitely the leading lady when sporting this trend. She’s got the look down ‘To a T’. 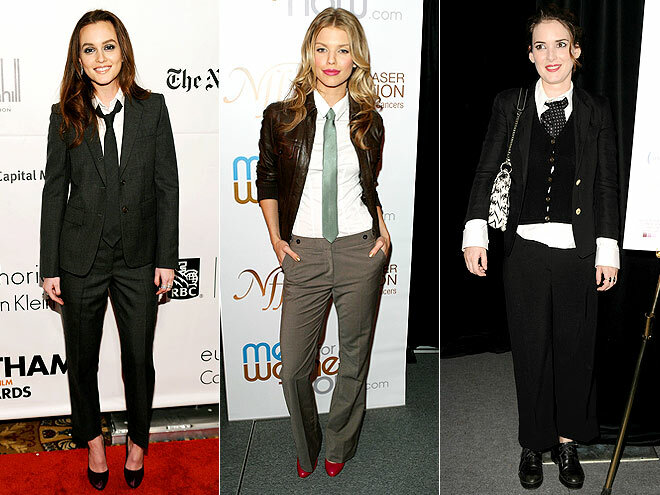 The necktie and button-up is a look I like to see on ladies…if it’s done right of course! For this look to work, stick to pieces that fit closely to your body. Yes this is a manly look, but we don’t want to look like men right! We still want to maintain and show off our female figure. AnnaLynn does it so well here, keeping all pieces slim and close fitted to her body. As we all should know by now, blazers are a staple in women’s wardrobe today! Plaid is a traditional pattern, so this paired with a classic piece like the blazer, you can go no wrong!